Text: Our theatres are now opened, and all Grub-street is preparing its advice to the managers; we shall undoubtedly hear learned disquisitions on the structure of one actor’s legs, and another’s eye-brows. We shall be told much of enunciations, tones, and attitudes, and shall have our lightest pleasures commented upon by didactic dulness. We shall, it is feared, be told, that Garrick is a fine actor, but then, as a manager, so avaricious! That Palmer is a most surprising genius, and Holland likely to do well in a particular cast of character. We shall have them giving Shuter instructions to amuse us by rule, and deploring over the ruins of desolated majesty at Covent-Garden. As I love to be advising too, for advice is easily given, and bears a show of wisdom and superiority, I must be permitted to offer a few observations upon our theatres and actors, without, on this trivial occasion, throwing my thoughts into the formality of method. There is something in the deportment of all our players infinitely more stiff and formal than among the actors of other nations. Their action sits uneasy upon them; for as the English use very little gesture in ordinary conversation, our English-bred actors are obliged to supply stage gestures by their imagination alone. A French comedian finds proper models of action in every company and in every coffee house he enters. An Englishman is obliged to take his models from the stage itself; he is obliged to imitate nature from an imitation of nature. I know of no set of men more likely to be improved by travelling than those of the theatrical profession. The inhabitants of the continent are less reserved than here; they may be seen through upon a first acquaintance; such are the proper models to draw from; they are at once striking, and are found in great abundance. Though it would he inexcuseable in a comedian to add any thing of his own to the poet’s dialogue, yet as to action he is entirely at liberty. By this he may show the fertility of his genius, the poignancy of his humour, and the exactness of his judgment; we scarcely see a coxcomb or a fool in common life that has not some peculiar oddity in his action. These peculiarities it is not in the power of words to represent, and they depend solely upon the actor. They give a relish to the humour of the poet, and make the appearance of nature more illusive; the Italians, it is true, mask some characters, and endeavour to preserve the peculiar humour by the make of the mask; but I have seen others still preserve a great fund of humour in the face without a mask; one actor, particularly, by a squint which he threw into some characters of low life, assumed a look of infinite stolidity. This, though upon reflection we might condemn, yet immediately upon representation we could not avoid being pleased with. To illustrate what I have been saying by the plays I have of late gone to see; in the Miser, which was played a few nights ago at Covent Garden, Lovegold appears through the whole in circumstances of exaggerated avarice; all the player’s action, therefore, should conspire with the poet’s design, and represent him as an epitome of penury. The French comedian, in this character, in the midst of one of his most violent passions, while he appears in an ungovernable rage, feels the demon of avarice still upon him, and stoops down to pick up a pin, which he quilts into the flap of his coat-pocket with great assiduity. Two candles are lighted up for his wedding; he flies, and turns one of them into the socket; it is, however, lighted up again; he then steals to it, and privately crams it into his pocket. The Mock-Doctor was lately played at the other house. Here again the comedian had an opportunity of heightening the ridicule by action. The French player sits in a chair with a high back, and then begins to show away by talking nonsense, which he would have thought Latin by those who he knows do not understand a syllable of the matter. At last he grows enthusiastic, enjoys the admiration of the company, tosses his legs and arms about, and in the midst of his raptures and vociferation, he and the chair fall back together. All this appears dull enough in the recital; but the gravity of Cato could not stand it in the representation. In short, there is hardly a character in comedy, to which a player of any real humour might not add strokes of vivacity that could not fail of applause. But instead of this we too often see our fine gentlemen do nothing through a whole part, but strut, and open their snuff-box; our pretty fellows sit indecently with their legs across, and our clowns pull up their breeches. These, if once or even twice repeated, might do well enough; but to see them served up in every scene argues the actor almost as barren as the character he would expose. The magnificence of our theatres is far superior to any others in Europe, where plays only are acted. The great care our performers take in painting for a part, their exactness in all the minutiae of dress, and other little scenical proprieties, have been taken notice of by Ricoboni, a gentleman of Italy, who travelled Europe with no other design but to remark upon the stage; but there are several improprieties still continued, or lately come into fashion. As, for instance, spreading a carpet punctually at the beginning of the death scene, in order to prevent our actors from spoiling their clothes; this immediately apprises us of the tragedy to follow; for laying the cloth is not a more sure indication of dinner than laying the carpet of bloody work at Drury-lane. Our little pages also with unmeaning faces, that bear up the train of a weeping princess, and our awkward lords in waiting, take off much from her distress. Mutes of every kind divide our attention, and lessen our sensibility; but here it is entirely ridiculous, as we see them seriously employed in doing nothing. If we must have dirty-shirted guards upon the theatres, they should be taught to keep their eyes fixed on the actors, and not roll them round upon the audience, as if they were ogling the boxes. Beauty methinks seems a requisite qualification in an actress. This seems scrupulously observed elsewhere, and for my part I could wish to see it observed at home. I can never conceive a hero dying for love of a lady totally destitute of beauty. I must think the part unnatural, for I cannot bear to hear him call that face angelic, when even paint cannot hide its wrinkles. I must condemn him of stupidity, and the person whom I can accuse for want of taste, will seldom become the object of my affections or admiration. But if this be a defect, what must be the entire perversion of scenical decorum, when for instance we see an actress that might act the Wapping Landlady without a bolster, pining in the character of Jane Shore, and while unwieldly with fat, endeavouring to convince the audience that she is dying with hunger! For the future, then, I could wish that the parts of the young or beautiful were given to performers of suitable figures; for I must own, I could rather see the stage filled with agreeable objects, though they might sometimes bungle a little, than see it crowded with withered or mis-shapen figures, be their emphasis, as I think it is called, ever so proper. The first may have the awkward appearance of new-raised troops; but in viewing the last I cannot avoid the mortification of fancying myself placed in an hospital of invalids. Comments: Oliver Goldsmith (1728-1774) was an Anglo-Irish novelist, playwright, poet and critic. The Bee was a periodical that he published himself. The Miser and The Mock Doctor were plays by Henry Fielding, both adapted from Molière. 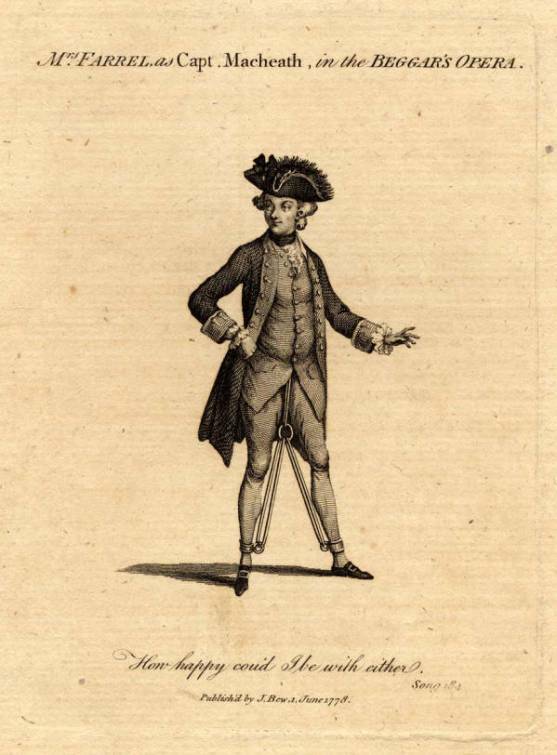 Antoine-François Riccoboni was an Italian actor whose treatise L’Art dit Théâtre was published in 1750. Text: Feb. 24. To theatre to see Mrs. Cowley’s new play; unfortunately it was hissed off the stage just before the conclusion of the last act; being in its progress of acting alternately and frequently hissed by its foes and cheered by its friends; the latter proved the minority, and therefore unsuccessful, as all in minorities are in State and Church, as well as theatres. Many came for the express purpose of supporting or damning it; her husband, a writer in one of the daily papers, employs his pen in criticising works of all other stage writers, and has, by the severity of his remarks, raised up a host of determined foes to crush whatever proceeds from his quarter; though no foreign considerations were needed to banish this piece from the stage, its own intrinsic unworthiness was more than enough; being a low performance, and unworthy the pen of the author of “Belle’s Stratagem” and “Who’s the Dupe.” Knowing the writer and her connections, I feel severely for them, especially, too, as her brother is a fellow-lodger, whose exquisite delicacy of feeling must be cruelly wounded on this occasion. The prologue and epilogue were excellent, and did great credit to the performers, Mr. Lewis and Miss Young, who were rewarded with universal applause. Comments: Samuel Curwen (1715-1802) was an American merchant and justice. As a British loyalist fled America in 1775, having been attacked for not opposing the British military action at Lexington and Concord, and spent ten years in Britain, during which time he became a supporter of the American cause. Hannah Cowley (1743-1809) was best-known for her 1780 play The Belle’s Stratagem. Its successor, The World as It Goes, subsequently retitled Second Thoughts Are Best, was a notable failure. Her journalist husband was Thomas Cowley. The prologue was written by Richard Josceline Goodenough. The performers of the prologue and epilogue, respectively, were Charles Lee Lewes and Elizabeth Younge. Text: Dec. 11th. Went with Pahlen to Covent Garden to see Shakespeare’s Comedy of Errors, of which the plot hinges on two brothers and two men servants who resemble one another so closely as to produce all sorts of embarassing situations. Regnard might have supposed he was witnessing his comedy of Ménœchmes. The fact is these plays read better than they act, because the illusion is destroyed by the want of resemblance, which is always lacking among actors. Terence gave the first idea of such pieces, but then the actors played in masks and the illusion was complete. The airs introduced and sung by Miss Tree and Miss Stephens did not add to the effectiveness of the play. Comments: Baron Philipp von Neumann (1781-1851) was an Austrian diplomat, posted at the Austrian embassy in London during the 1810s and 1820s. His diaries provide a detailed account of the political and high society life of the time, and document his many visits to the theatre and opera. Shakespeare’s play and that of Jean-François Regnard were each indebted to Plautus‘s Roman play Menaechmi. The production of The Comedy of Errors seen by Neumann was an operatic staging by Frederic Reynolds, featuring songs by Henry Bishop. 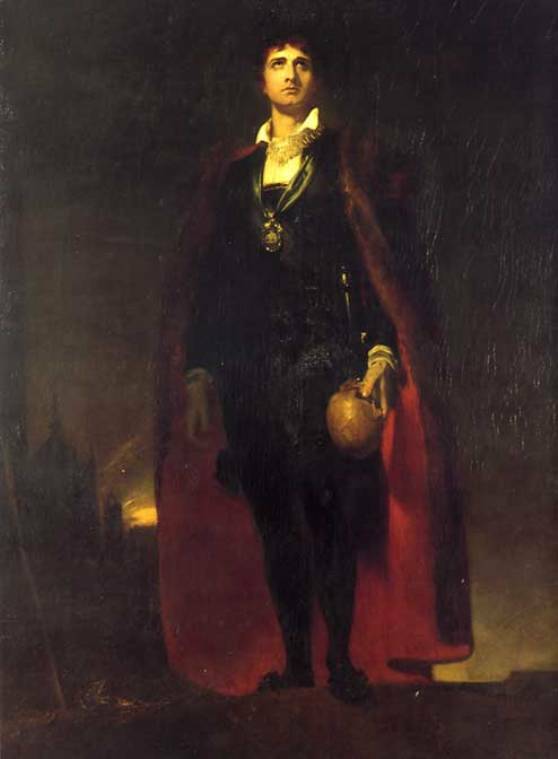 Reynolds specialised in musical adaptations of Shakespeare’s plays. The singers were Anna Maria Tree and Catherine Stephens. Text: A riot happened at Covent-Garden theatre occasioned by a demand being made for full prices at the opera of Artaxerxes. The mischief done was the greatest ever, known on any occasion of the like kind; all the benches of the boxes and pit being entirely tore up, the glasses and chandeliers broken, and the linings of the boxes cut to pieces. The rashness of the rioters was so great, that they cut away the wooden pillars between the boxes, so that if the inside of them had not been iron, they would have brought down the galleries upon their heads. The damages done amount to at least 2000l. Four persons concern’d in the riot have been committed to the Gatehouse. Comments: The opera Artaxerxes by Thomas Arne premiered successfully at Covent Garden on 2 February 1762. When it was revived at the same theatre on 24 February 1763 a riot occurred in protest at the abolition of half-price admissions. It has been the custom to sell half-price tickets for latecomers who would see only the short afterpiece rather than the main attraction of the evening. This change in policy was fiercely opposed by some and led to several such riots, at Drury Lane and Covent-Garden. The protests caused the half-price concession to be re-introduced when the theatre re-opened on March 2nd. 2000l is £2,000. Text: Sept. 25. At Covent Garden Theatre; performance, “Beggar’s Opera;” parts well played, but great impropriety, not to say indecency, in Mrs. Kennedy’s personating McHeath. Bravery, gallantry, and a fearless disregard of death, the characteristics of that notorious highwayman, which female softness awkwardly imitates. Following entertainment, falsely so called; execrably foolish and childish. I am sorry to arraign even the shilling gallery for want of judgment, in suffering such unmeaning stuff to pass for a farce. Comments: Samuel Curwen (1715-1802) was an American merchant and justice. As a British loyalist fled America in 1775, having been attacked for not opposing the British military action at Lexington and Concord, and spent ten years in Britain, during which time he became a supporter of the American cause. 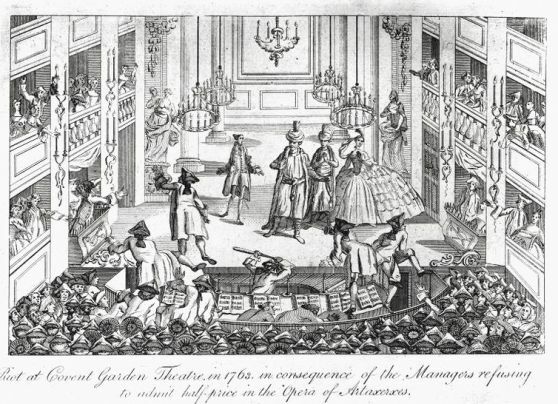 John Gay‘s ballad opera The Beggar’s Opera was performed at Covent Garden on 25 September 1780 with the contralto Margaret Kennedy, well-known for her performances in male roles, playing Macheath.